It takes a lot of courage to choose, maybe an innovative, but nowadays not a very popular design type and make a debut on the market with it. Yet, that’s exactly what the Warsaw-based company with a quite revealing name Ciarry did offering their open baffle loudspeakers. 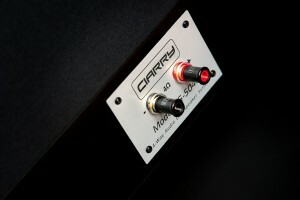 We have received their first product called Ciarry KG-5040 for the test. Let me start with a short explanation regarding the „revealing” name of this manufacturer. „Ciarry” could be translated to „Shivers” that, one may assume, should go up one’s spine when listening to these speakers. Do they? Well, keep reading to find out whether they do, at least for me. I am one of those “weird” people who are not big fans of bass-reflex cabinets. This solution was invented for convenience of users (and designers), not to improve sound quality. It allows designers to use smaller cabinets with narrow front baffles, which improves so-called WAF, because of small footprint. Due to bass-reflex design even relatively small loudspeakers can offer large sound with punchy bass. In many cases (I admit that not always though), advantages of the lower part of the band actually end with it being “punchy”, because what they gain in “power” they also usually lack in purity and naturalness. This solution has been used so often and people got so used to it that bass played with other designs, ones having a much longer tradition, seem weird, or even “unnatural”. I heard such comments many times, for example during audio shows. The very same people later entered another room and I saw smile on their faces when they heard the boomy version from some bass-reflex speakers! OK, I may be a little mean here. Yet, while being perfectly aware that I am not the only one who knows the “accurate” or the “right” sound, I do believe that it is a good idea to verify from time to time one’s concept of a good, natural sound by going to a concert, preferably an acoustic one. One may find out there that the sound is cleaner, the attack is more direct (less blurred), that the decay is a very important element of sound, but there is no need to artificially extend bass notes, to add artificial boom… and so on. After such verification against live sound one should listen to several different loudspeakers based on various designs and then decide which one of them sounds most natural. Although, on the other hand, not everyone is looking for a natural, “live-like” sound, and not everyone can use large speakers and to be honest, open baffles or horns usually come in a BIG size. Obviously, all of that was my personal opinion that you may agree with or not. I am first of all music lover and I have my personal expectations when it comes to sound and audio components, but I do not intend to impose them on anyone. Each and every music fan should choose the means of listening to the music that suit their needs most. Having said that, I do ask for an open mind. Forget any prejudice, just listen to the music (not the system) and decide whether you like it or not. Ever since I heard my first horns, open baffles and closed-box, transmission line speakers I knew that a good implementation of one of these solutions is something for me. I already had horns in my system. 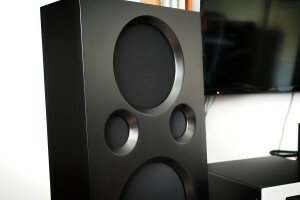 For some time I also used open baffles, and currently I have sealed-box speakers. 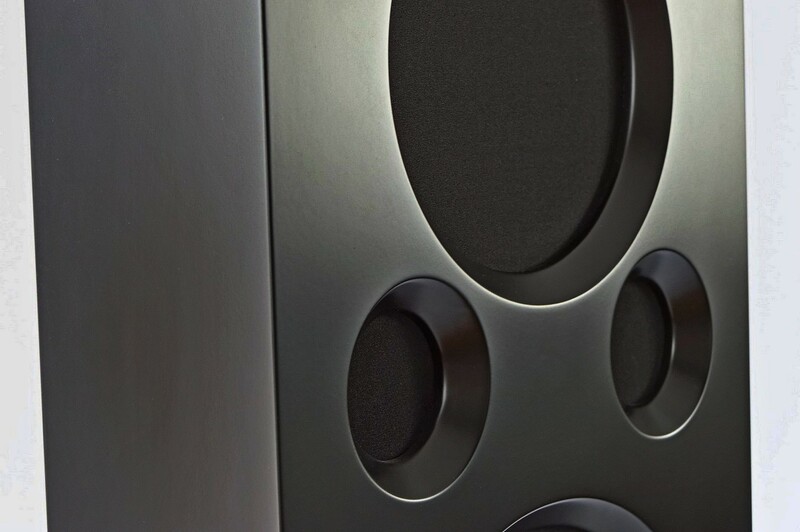 Each of these designs has its own advantages and disadvantages – after all, there are no perfect audio components. With this review I got another chance to listen to open baffle in my room, in my system and was really waiting to get to know them. I remember really well the times (more then one actually) that I spent with other Polish open baffle speakers, called Ardentum, and I was really happy about their performance. 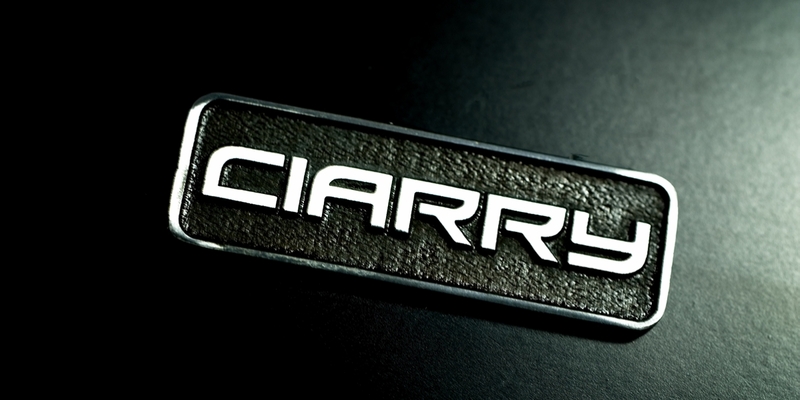 Before this test I heard a lot of good things about Ciarry, so my expectations were high and were not let down. 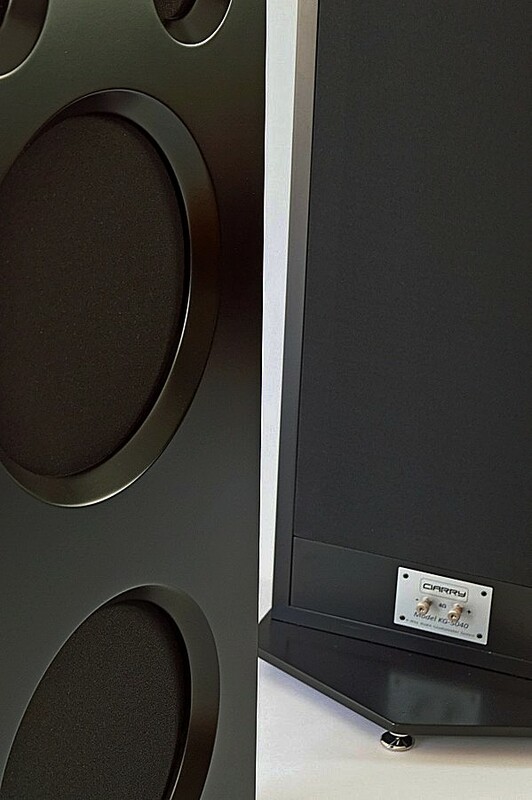 KG-5040 Ciarry is an exotic design not only because drivers work in an open baffle, but also because it is a 5-driver and 4-way loudspeaker. For the bass there are two 15-inch drivers, then there is another, 10-inch one for bass and mids, the 2-inch dome is responsible for medium and high tones up to 10 kHz, and then come a ribbon tweeter. 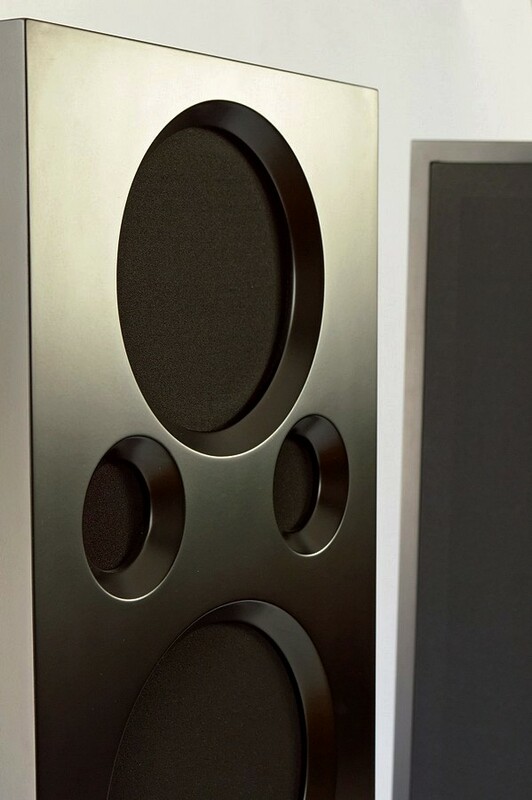 According to manufacturer these speakers are able to deliver sound in a wide frequency range (29 Hz to 40 kHz) so they should be able to play any music. If you have already imagined set of these drivers it must be clear to you by now that the Ciarry are big! They stand 126cm tall, 45cm wide and 18.5cm deep, and yet you still need a 47x38cm base equipped with solid adjustable spikes (pads to protect the floor are included), so the depth is actually bigger. The base allows this large, slightly tilted construction to be fully stable. 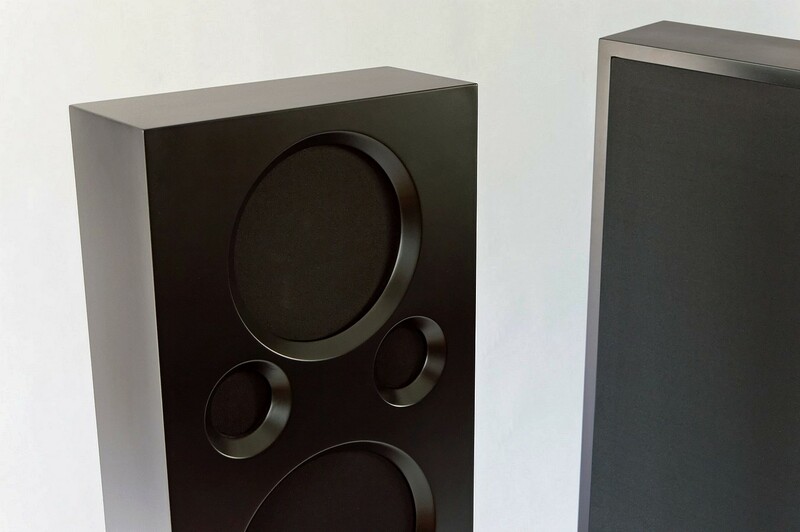 These are 4Ω speakers, and the efficiency reported by the manufacturer is 91 dB, which suggests they are quite easy to drive. 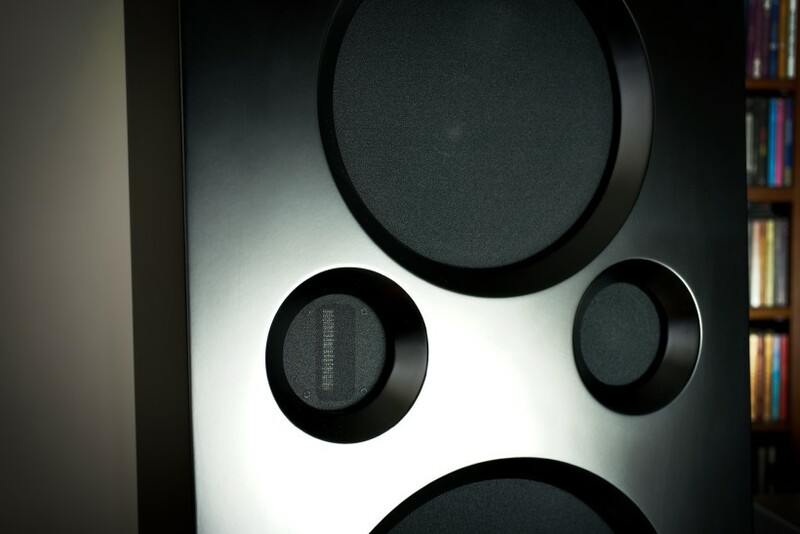 As it turned out in practice, these speakers like powerful amplifiers more, but we’ll get to that in a moment. 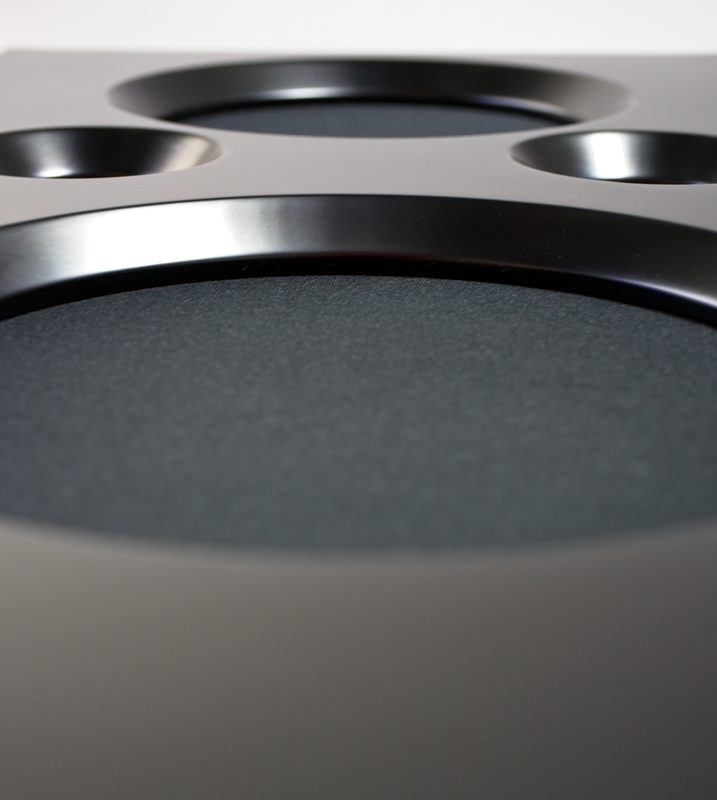 The Ciarry KG-5040 are floor-standing open baffle loudspeakers. 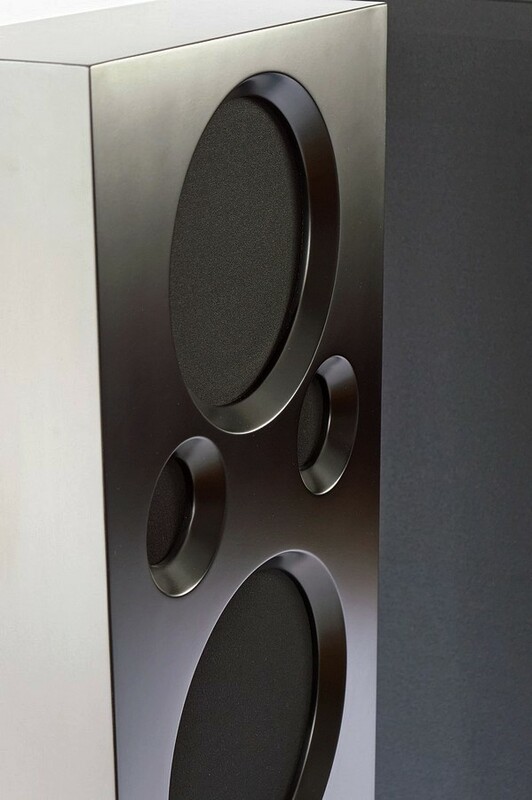 This is a 4-way, 4 Ω design with a nominal efficiency of 91 dB featuring five transducers per channel. 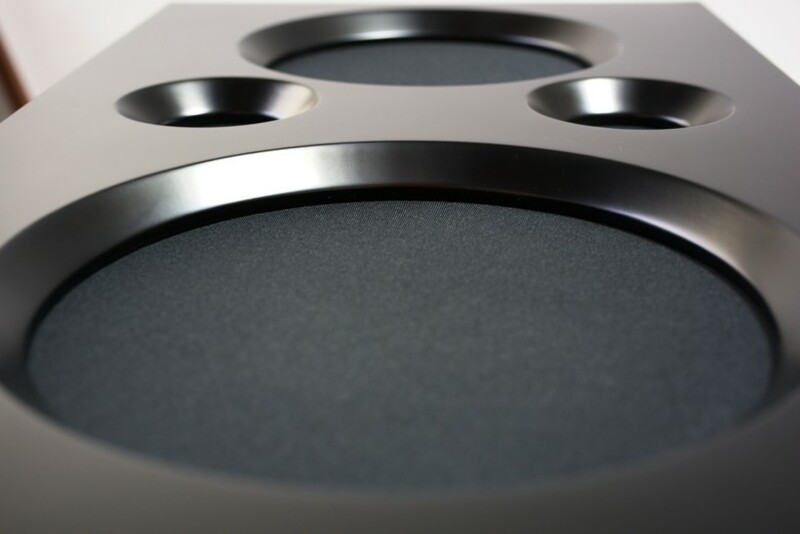 The bass range is delivered via two powerful 15″ woofers with paper membranes. 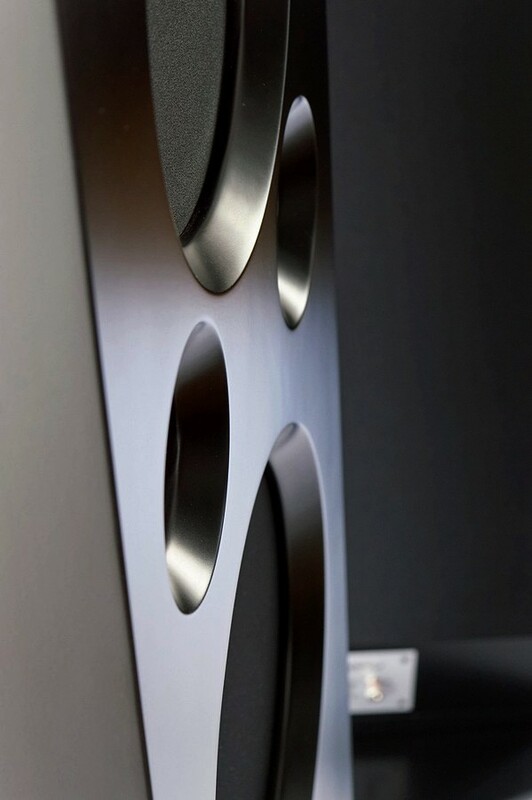 Above them one finds another, but this time 10″, low-midrange woofer, then a 2″ dome that operates up to 10 kHz, and last but not least, a ribbon tweeter delivering everything above 10.000 Hz. All drivers are hidden behind non-removable grills (on the front, as the whole back is hidden behind one large, also not removable grill). Housings, i.e. 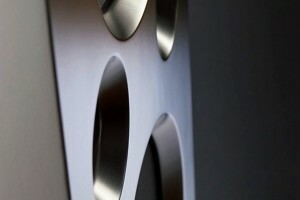 fronts, side and top baffles, are made of MDF. Openings for drivers in the front panel have been precisely milled, and the drivers are screwed to the baffle from the back. Visually, also due to the gentle tilt of the front baffle towards the back, together with the side and top walls and a black grill covering the open back, this gives an impression of “regular”, although by today’s standards somewhat wide and quite shallow, loudspeakers. 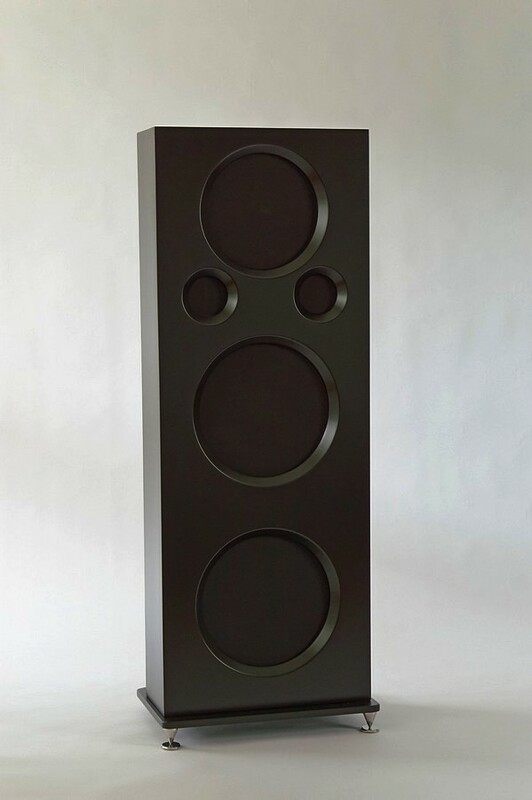 The whole structure is fixed to a solid, black-painted steel base that provides adequate stability of this tall design, and at the same time they add weight to it (to the total of 51kg per piece), which, as the designer told me, has an experimentally confirmed positive impact on the sound. There are two sharp spikes in the front and a semicircular feet in the back screwed to the bottom of the base. The set includes also appropriate pads to protect the floor. 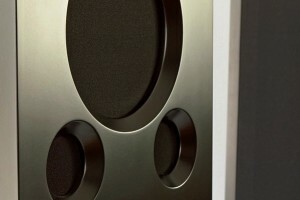 There is a pair of high quality, user-friendly speakers posts in the lower part of the rear panel. 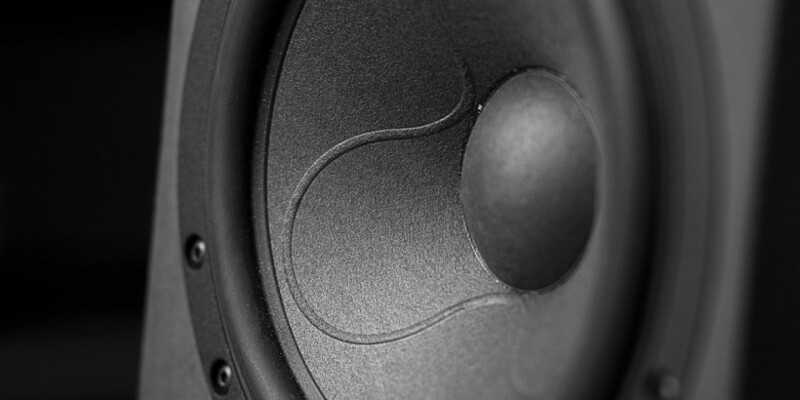 The signal from them goes to the crossover located on the bottom of the speaker. As Mr Jacek told me, the design of the crossover is quite particular and rarely used as there are no resistors in the signal’s path. 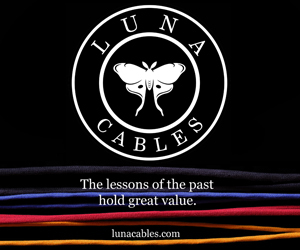 The low-frequency section uses coils with a toroidal core. 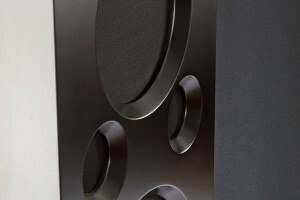 The choice of the internal wiring for these loudspeakers took a lot of time, as different wires offered different sound. Finally, some Chord and Audioquest products were chosen to do the job. 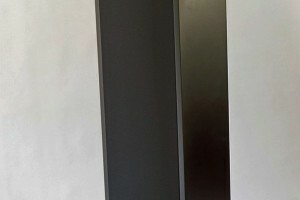 I actually received the Ciarry loudspeakers as one of the components of the whole system prepared by the Polish Audio Cluster, of which the Warsaw-based company is a member. 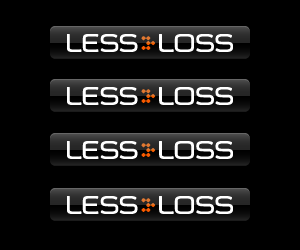 This is an organization associating (at the time of this test) 10 members – Polish audio manufacturers. 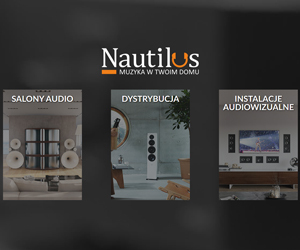 The goal of this organization is a broadly understood cooperation – joint promotion (including reviews) and marketing, participation in exhibitions and other events, as well as, and perhaps above all, offering customers complete audio systems. 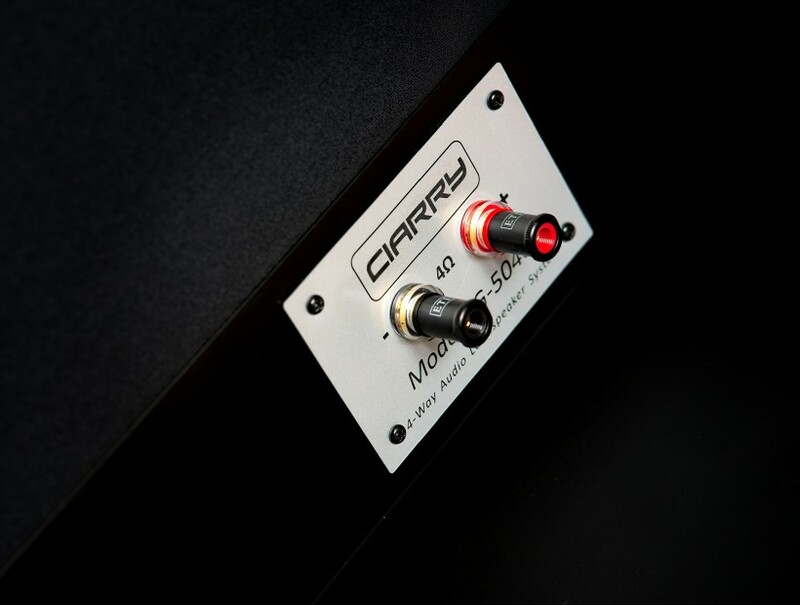 That’s why Ciarry initially were hooked up to the EggShell Prestige 12.2 tube amplifier (12W, Class A with KT88 tubes), and the whole system was wired using Audiomica Excellence series cables. The review of this system was published in the September, “Polish” edition of HighFidelity magazine (see HERE). As a system, it sounded musically engaging, it did a great job conveying emotions and acoustics of recordings. In other words, the listening session was definitely a very nice experience. 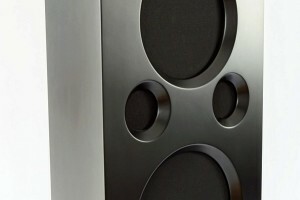 Having, however, previous experience with open baffles, including the aforementioned, also Polish, Ardento, I knew that to show their full potential many such designs, even those of relatively high efficiency, require amplifiers with a higher output than this particular model of EggShell offered. 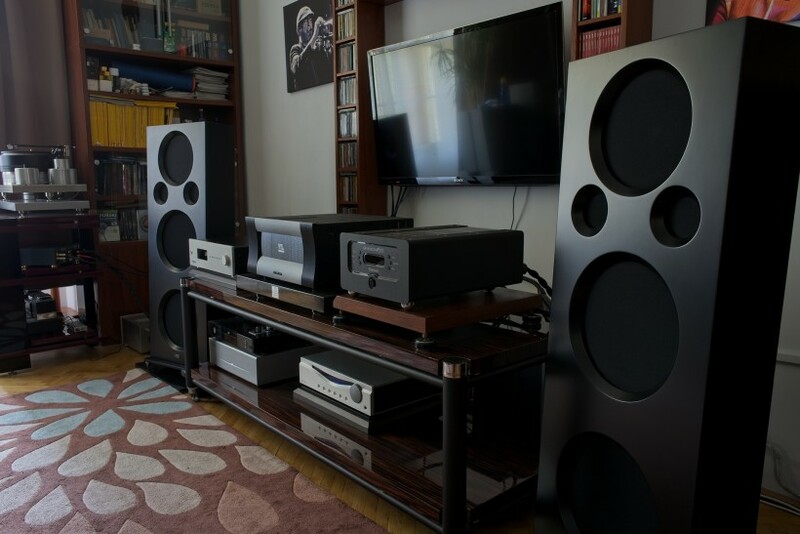 So I suggested to Mr. Jacek Barejka, the owner of the brand and the designer of these speakers, a separate test, in which the KG-5040 would play with my system. Although I did not have my more powerful solid-state amp, the Modwright KWA100SE, at the time but I was sure that the amazing GrandiNote Shinai integrated, offering 37W per channel in Class A, would give the KG-5040 a fair chance to present their full potential. As an analog source I used my J. Sikora Standard turntable, the Max version (the company is also a member of the Polish Audio Cluster), but for this test my trusted AirTight PC3 cartridge was replaced in the Schroeder CB tonearm with one of the best cartridges I know, Kondo IO-M. The Japanese cartridge was additionally supported by Kondo’s own SF-z step-up transformer, that amplified signal before sending it to my GrandiNote Celio mk IV’s MM input. 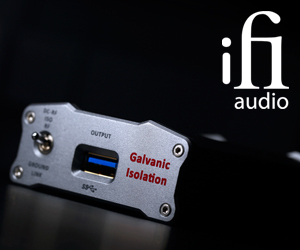 At the digital front-end I used two excellent Polish DACs – my LampizatOr Golden Atlantic and the solid-state version of the RT-Project DAC One (see HERE). Let me just shortly tell you also about the speakers setup. In my room I found that placing them about 50cm from the wall behind them and using just a small toe-in was an optimal setting. Usually, I place most speakers bit farther away from the wall, but this also means that they get closer to the listening position, and in the case of Ciarry, however, a larger distance was an advantage. In most cases I also use more toe-in, but it didn’t work this time. It was also important to remove acoustic treatment panels from behind them. These are useful for “standard” loudspeakers, but in the case of dipoles, the sound is often better with a naked wall behind them, and so it was also in this case. In the Cluster system, that I mentioned, I already liked Ciarry a lot. However, with Shinai, just as I expected, due to higher output they achieved an even higher level of performance. 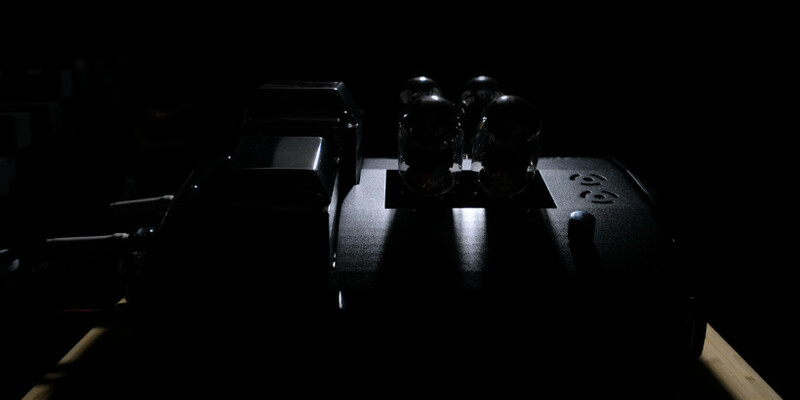 Since two other renowned reviewers had tested these loudspeakers before me and both of them use powerful transistors in their systems, I guess it is safe to assume that while these loudspeakers are capable of delivering a very good performance with high quality low-power tube amps, such as the one from EggShell, they will usually do even better job when fed with more power. With the EggShell in a small room, using not particularly challenging volume levels, Ciarry will deliver highly enjoyable, engaging performance. 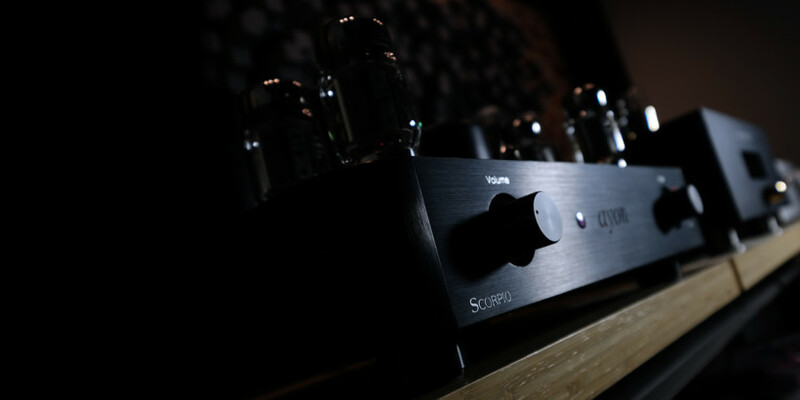 I am simply claiming, that they can do even better combined with an amplifier delivering, I would say, 30+ W. It doesn’t have to be a solid-state, a high quality tube amplifier will do, too. I had a chance to check that option using another device delivered for test, the powerful, and great sounding VTL S-200. The Shinai primarily (but not only) provided better controlled and defined bass, improved timing and allowed me to use higher volume levels without any downsides (compared to EggShell). 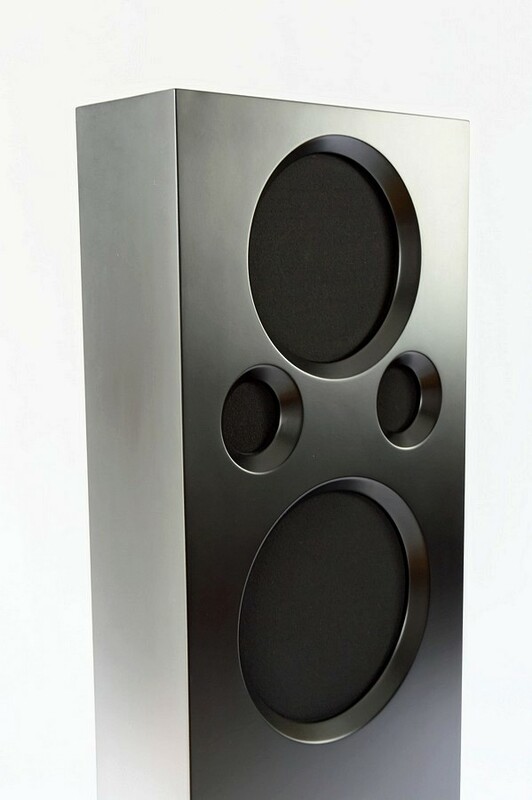 Looking at such large speakers, man subconsciously expects a large, powerful sound, I mean, based on powerful bass. Taking into account also the ribbon super-tweeter one would expect also a particularly extended. crisp treble. Yet, even with a powerful amplifier, the Ciarry delivered an open, coherent sound, with none of the band’s extremes jumping out at me. In fact, the first thing that attracted my attention was how wide the soundstage was with them. This aspects of the presentation, of course, depends in part on how the speakers are placed in the room, and the room itself, but at my place, with not so much space behind the speakers, but a lot of it on the sides, the stage was very wide. When appropriate (I mean – so recorded) sounds popped up way on the left from the left speaker and on the right from the right one and it sounded absolutely natural, not as something artificially created by system. The effect of such a wide soundstage was not achieved by moving the instruments further away from each other, but rather through a close perspective given to the listener. The whole performance was shown quite close to me, the sound seemed to expand towards me, and generally, when the stage is so close, the perspective changes and simply gets wider. 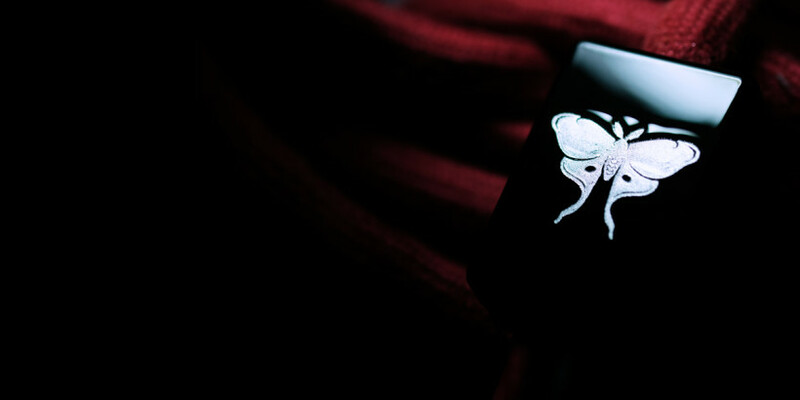 Importantly, the Ciarry, despite their size, were able to disappear completely from my room leaving me with pure music. Although it’s a four-way design, the sound is very coherent. 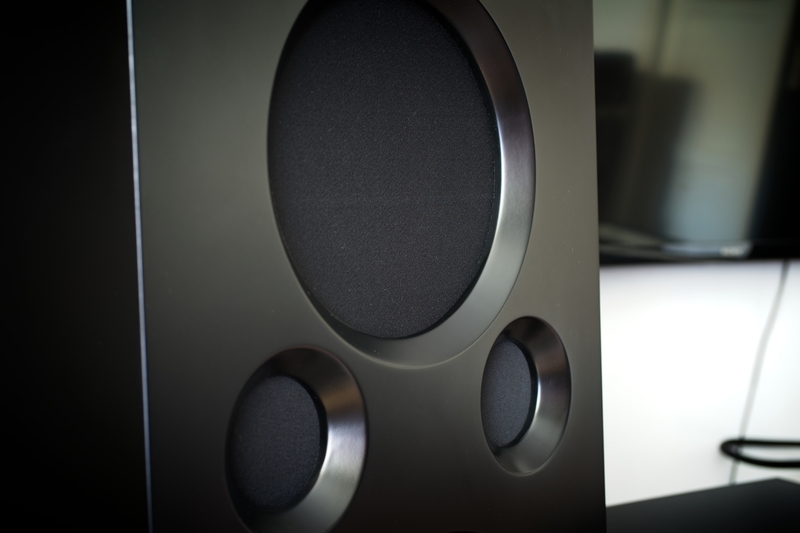 It may not be the absolute coherence that I know from single-driver speakers, but for a multi-way design it is excellent. At this point I’d like to go back to what I wrote earlier – the both band’s extremes do not dominate the performance, but are part of it, both supporting the most important part of the band, i.e. the midrange. In terms of bass, it seems that the manufacturer focused their efforts on dynamics, speed, compactness of low tones, not maximum weight or extension. When needed, you will get to hear lowest sounds, well articulated, compact, energetic, but with no dragging, no additional “support” served, for example, by many bass-reflex cabinets, in the form of this “boooooom”. The latter creates an impression of a more weighty, more powerful sound, but at the same time it lacks proper purity and definition. These loudspeakers, despite the large, paper woofers (which do not belong to the fastest ones I know), you can hear the speed of the sticks hitting the drums and even the fast, springy reaction of the latter. The kick drum might not quite have the slam that my own Ubiqs deliver, but it is still energetic, fast and clean, which is not something I can say about many speakers I know. There are some loudspeakers that allow listener to feel the most powerful bass notes physically in his bones – the Ciarry are not really one of those. So if that’s what you are looking for and it is a key decisive factor for you when picking up your loudspeakers, then these are probably not for you. If, however, you prefer purity and definition, if the differentiation of dynamics and tonality is more important, if you want to hear every detail, because these are not blurred, then consider these Polish an interesting option. Before the test, I was also curious about the presentation of the the top of the band. 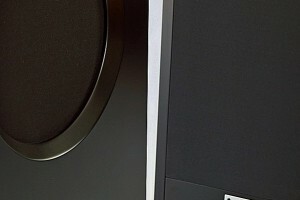 After all, one doesn’t see often domes operating up to 10 kHz, at which point a ribbon super-tweeter takes over. That’s a rare solution so I didn’t really know, what to expect. Sure, none of the amplifiers I used during this test had an overly emphasized treble. 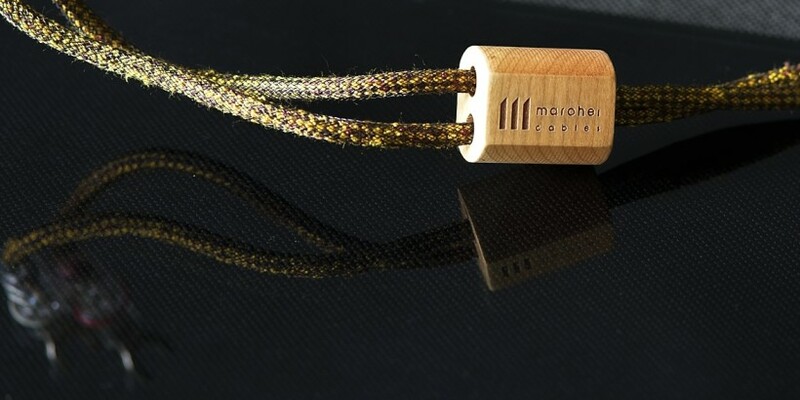 Both Shinai and later also the VTL focus on sophistication, purity and natural delicacy of the upper part of the band. It is possible that the performance of Ciarry with another amplifier with a stronger top could differ to some extent. With Shinai, a Class A solid-state, there was no trace of any aggressiveness, sharpness or graining in the upper registers. It was smooth, albeit resonant, there was plenty of air, openness, sound was unrestricted and unforced, there was also a long, beautiful decay when needed. My hearing may not be the same as 20 years ago, but I dare say that there was no obvious limitation at the top. The Ciarry were also able to accurately render the acoustics of recordings – reverberation in the yard of the Noirlac abbey in the Michel Godard’s recording was delightfully realistic. Maybe the depth of the stage was not the greatest I’d ever heard on this album, but the impression of participation in the event taking place in a huge space was overwhelming. My traditional test with Bizet’s “Carmen” with wonderful Leontyne Price revealed a similar result. The soloists moving in front of the stage were rendered in a quite a precise and natural way. The choirs marching far behind them were somewhat closer than I’m used to, but the impression of a large distance between the foreground and the events in the back was preserved. Once again, let me remind you of the particular setup of Ciarry in my room, because different setup might yield different results. Open baffles like to have a lot of space around them, and neither the distance from the wall behind them nor from the listening position were (in my opinion) optimal. 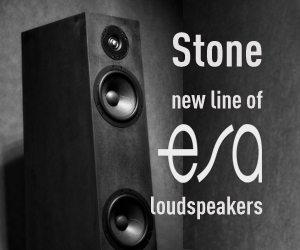 I believe that a larger room would be highly welcomed by these speakers. But it also proves a versatility of the KG-5040, because they did a great job even in these sub-optimal conditions. The greatest strength of the Ciarry is midrange. As I mentioned earlier, both band’s extremes, despite being presented in a tremendous fashion, perfectly blend with midrange complementing and supporting it. As a result, mid-tones are full, saturated, provide an abundance of information, while being well-differentiated and clean. There is no coloration, there is no artificial emphasis in this part of the band, which is a trick that brings positive effects in some circumstances, but here it would be completely unnecessary. Each instrument, each voice had the right weight, right size, although it did happen in several recordings, where the leading instrument or vocals were recorded with a close-up microphones, that Ciarry slightly enlarged them. There are two elements of the sound that I really value – the naturalness, which I define as resembling the live sound I remember from concerts and an unlimited, but absolutely natural expression. The KG-5040 excelled in both. The former allowed me, when listening to Paco Lucia, to see his guitar in front of me with all the details of the box, strings, fingers dancing at a rapid pace along the fretboard and so on. And it’s not at all about a particularly high precision of Ciarry, because there are other better speakers in this respect, but about the naturalness of the presentation that gave my imagination a chance to create such a lively image of this performance. The expression element, on the other hand, caused a pure fire to come out of speakers when Janis Joplin, Marek Dyjak, or many more particularly charismatic singers performed for me. When, on the other hand, Eva Cassidy or Anna Maria Jopek sang nostalgically, the room was filled with completely different, but no less real, emotion. 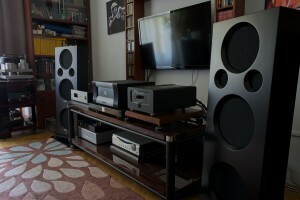 That’s what an audio system, or any of its components should, in my opinion, do for a listener. That’s what I look for and found in Ciarry. While listening to Ciarry using the 12-watt EggShell amplifier I focused mainly on acoustic music and vocals, there were no longer any repertoire preferences with either Shinai or even more powerful VTL. From rock classics by Led Zeppelin, or Pink Floyd, to more contemporary U2 and even Metallica albums, each of them sounded energetic, powerful, delighting me with dynamics and very good timing. Again, it was clear that my Ubiq Model One complemented such music with a more powerful, more substantial bass, which has its advantages, and yet I did perceive the Ciarry’s presentation not as inferior, but just as a different one. Classical, orchestral music had proper momentum, but a nicely controlled one, with the orchestra well-arranged, layered. The Mozart symphonies and operas, as (almost) always were a great source of fun, but also the more serious Mahler and Wagner works were highly enjoyable. Mozart music was so much fun because it allowed me to appreciate the finesse of Polish speakers, I could follow numerous, interwoven melodic lines, choose instrument sections I wanted to focus on, or simply absorb the performance as an amazing, ingenious whole. The other ones provided me with means to assess the tempo, timing, momentum of the presentations, as well as a wide, well layered perspective creating, to an extent possible at home, an impression of facing a huge, powerful orchestra combining dozens of instruments playing in perfect harmony. From my perspective it seemed that these speakers could simply do it all. No matter what I threw at them they always responded vigorously and yet in a slightly warm, smooth, highly enjoyable fashion. 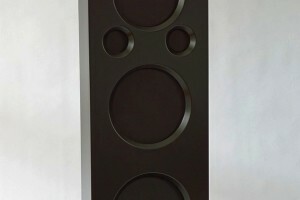 I hope it is obvious by now, that the Ciarry KG-5040 are not for everyone, and not only because there are no speakers that could satisfy every music fan. Although they are a beautifully made and finished piece of furniture that will nicely fit even into an elegant living room, their size and proportions will make it impossible for everyone find a proper space for them. Before publication of this test I found a brand new, smaller model on the manufacturer’s website. It is called KG-4030, and it may solve the space related issue at least for some potential buyers. 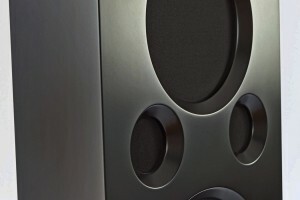 Those, who are attached to bass-reflex-style bass reproduction, or some other colorations caused by speakers’ cabinets, will probably, at least at the beginning, feel uncomfortable with Ciarry. If, however, the size is not a problem and you can keep an open mind for perhaps different, but really closer to the live music experience, then you must give these Polish speakers a chance. A great adventure awaits! You will hear a smooth but energetic and focused sound combined with very good timing and above-average differentiation of the lower end. 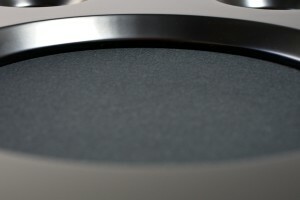 Let’s add an open, resonant, but at the same time smooth, “seamless” top of the band. Plus Ciarry offer a huge soundstage filled with air that allows instruments to breath, with phantom images that are realistic even though these speakers are not among the most precise sounding ones I know when it comes to imaging, they do not draw sharp contours, they don’t carve smallest detail, they are not proper tools for in-depth analyses. I perceived their performance in a similar way to a live concert, because during concerts I never wonder whether a guitar is of the right size, whether the double bass has enough weight, and so on. I accept them as they are, focusing on the music, emotions, ambiance. I felt similar when listening to the Ciarry KG-5040, because the key element of the sound they deliver is midrange, and both, really well reproduced band’s edges support and complement it perfectly. Even in this part of the band I found no artificial warmth, no added density or weight – such tricks are simply not needed here, and could even harm the proper balance between all sub-frequency ranges. 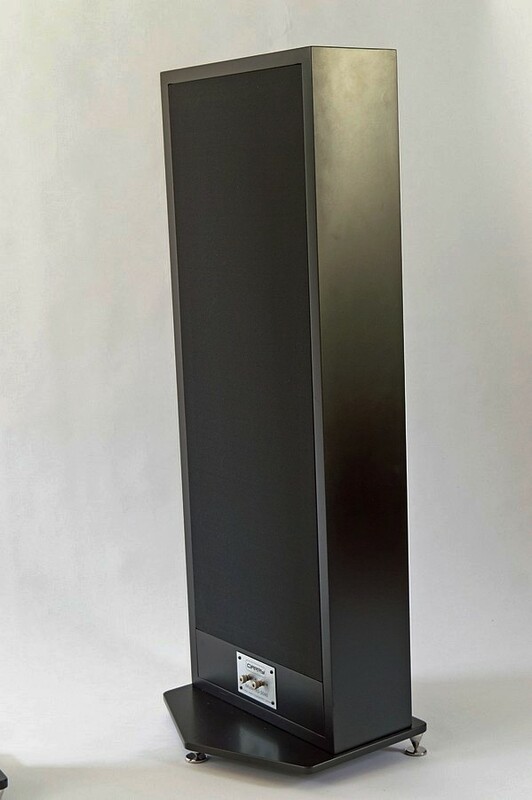 These are loudspeakers for a music fan who craves emotions and close, direct contact with performers. No box coloration, no boomy bass from b-r port. Just music.